This recipe comes from a cookbook my sister-in-law gave me for Christmas a couple of years ago. Normally I use fresh apples but this time I tried using apples I canned back in August. The cake turned out perfect! Mix all dry ingredients together. Beat eggs, oil, vanilla, and sugar. Mix with dry ingredients. Fold in apples and pecans. Bake at 350 degrees for 1 hour 15 minutes. The batter is very thick so I usually add milk to thin it out some. Last week Pat began working on a cutting board; it's made from oak that is at least 75-years old. I love the color and feel; it's 1.5-inches thick and weighs at least 5 pounds; maybe more. Since I didn't want to scratch it up. When we have bad weather I prefer to take Jonathan to his classes so he doesn't have to search for parking and then walk a great distance in the ice and snow. With today being a "bad weather day" I had Elizabeth gather up her books so we could do her school work at the library. Today we were able to watch the snow from one of the big windows while working. This morning I woke up feeling like doing "NOTHING"! So Elizabeth gathered her constant companions and we loaded up the car... our destination? Levelland! Our goal on day trips is to find thrift stores and antique store...sadly Levelland only had one small Goodwill and no antique stores. Next we headed for Littlefield...no thrift store or antique store could be found! I did however find some flour, that came in an old fashion cloth bag, on sale for $4.99 for 25 pounds. It was sold as "buy this 20 pound bag and get one 5 pound bag free". Elizabeth loves the fabric so I think I will make her a tote bag out of one set. Once we got back to town we hit some of our regular thrift stores and then stopped at the ice cream store for a treat...Elizabeth just has to have the bubble gum ice cream! Even though our day trip wasn't exactly what I hoped for...it was still a nice get away. But, I think next time we will head for a larger town. Last week as I was gathering all my supplies for pinning the quilt I realised my quilt back wasn't big enough! I had found a wonderful king size flat sheet that was perfect for the quilt back but now I have a dilemma; Should I add a piece of fabric to the sheet, remove one row of blocks, or search once again for a second sheet and hope to find 2-pieces so I can piece the back in the same fabric? Hummm, by the time I finish this quilt it just might be summer! Oh, how I love old things! For some reason, either good or bad, old things and bargain shopping go hand in hand. Where I stumbled upon a most charming set of glasses. The set is missing one medium size glass but now I have a reason to search out antique stores looking for one lonely glass. I did not need these but had to buy them...because they were less than 9-dollars...and because I love the feel of glass...and because I really like green...and because they remind me of The Brady Bunch...and because, and because, and because, and because...! Over the years I have learned baking cookies on parchment paper produces a better cookie; not necessarily better in taste but better in form. Parchment paper is a bit pricey, I pay just under 3-dollars per box, but it is worth every cent. When I make oatmeal cookies I like to "plump" the raisins before mixing the dough. To do this simple place raisins in water and bring to a boil; cover and turn off heat. Raisins will soften and plump up in about 20 minutes. Drain before adding to the cookie dough. I love oatmeal cookies with soft raisins; yummy! Mix dry ingredients; except oatmeal. Beat margarine, sugars, eggs and vanilla until creamy. Add dry ingredients; mix well. Add soft raisins; mix well. Add oatmeal; mix well. Bake 350-degrees for 10 to 12 minutes. I just love looking at old photos; so when my mom e-mailed me a couple of photos this morning I was pretty excited. 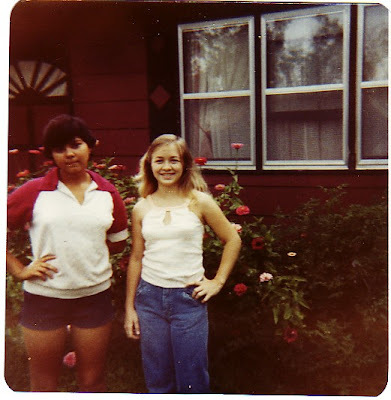 This is me when I was 15 or 16 with my best friend Rita. I am the one with a summer tan and short dark hair. Now that we have a nice supply of grain we needed a way to protect it from the snow and/or rain. To solve this problem Pat gathered several pieces of scrap fabric, that is water resistant, and made barrel covers. Each barrel cover is held in place with webbing and D-rings. The covers were completed just in time since everything was wet this morning. Thankfully all the grain inside was dry. Yesterday I almost had a panic attack! The chickens had just about finished up all the Milo we purchased back in October and when I called the grain elevator for more they didn't have any to sell. Thankfully they recommend another elevator that had some available; and this time we were able to buy red Milo. With the first trailer load we filled 7 barrels. Our second load of grain consisted of more Milo and this time corn; the corn is more expensive but I like giving it to the chickens as a treat. We ended up with 4 full barrels of corn. It has been awhile since the chickens had corn and they were very excited to have it once again. It feels good to know we now have enough grain to hold us until the next harvest season. We tried cooking some of the popcorn we grew last year. The kernels brown very quickly but aside from that it popped up very nicely. It sure is fun eating foods you harvest yourself. Supper this evening consisted of roast, carrots, potatoes I grew and canned from the garden and gravy. It was so good! Each time I open up a jar of my home canned foods I get anxious for the garden season to begin. Just before Christmas I purchased some "fun foods" to put in the kids stockings. One of the food items was 100-calorie cookie packets; I didn't buy them because they were "diet"... I bought them because they were just the right size to fit into a stocking. Later in the day Elizabeth told me she couldn't feel any cookies in her bag. When she handed it to me sure enough she somehow ended up with a "bag of air". My second free food item was a sample of Pop-tarts that came in the mail. It was grape flavored and tasted just like my homemade grape jelly. Elizabeth really liked it and by the time I thought of taking a picture this is all that was left. So far my favorite Pop-tart sent in the mail was the blueberry muffin Pop-tart. This is so fun getting to be one of the first to try out a new flavor! Last night I read about a Free Fresco Taco being offered at Taco Bell; I promptly printed the coupon and used it today while in town. The taco is a "diet" taco but it didn't taste anything like "diet". However, it wasn't a typical taco; flour tortilla, little meat, and lots of veggies. Elizabeth and I shared the taco and we both really liked it! The sewing class meets twice a month from now through May. I think the girls are going to be excited tomorrow when they see what their project will be! Right before Christmas Jonathan called the Kim Komando show to ask some questions about buying a lens for his camera. Getting through on the phone takes patience; after dialing the phone and waiting through numerous busy signals for over an hour Jonathan managed to get a "live person". Next came a 45-minute hold before he was able to talk to Kim Komando live over the air waves! Because it was the Christmas season Kim Komando gave gifts to the callers fortunate enough to get through. Guess what Jonathan won? That's right, a Litl laptop! Since Jonathan already has a laptop he has passed this one on to me. How sweet can he be? Very Sweet!!! Thank you Jonathan and Thank you Kim Komando! Finding coupons has been a challenge ever since our local Sunday Paper went from 1-dollar to 2-dollars an issue. If I am going to pay for a paper is has to pay for itself plus some or I just do without. However, doing without coupons has caused me to miss some great bargains so I have been dabbling in buying coupons through e-bay. Recently I purchased some Kraft Cheese coupons for the cost of 1-dollar for 20-coupons. When my local double coupon grocery store had a sale on Kraft Cheese (2-dollars a package) I was able to buy 16-count packages of cheese for 1-dollar per package (after my 50-cent coupon doubled to 1-dollar). The savings on cheese more than paid for the 1-dollar I spent for the coupons. Another great deal I recently found was for Welch's 100-percent juice; these were selling at a local store for 1-dollar each. My coupon was for 1-dollar off 2 bottles of juice any size. My final cost was 50-cents a bottle; these will work perfect for when we bring lunch to town. Our local Wal-Mart store had orange juice (originally 3.12 for 64-ounces) on roll-back for 2.88; I had 1-dollar coupons so the final cost was 1.88 per carton. I took a chance and purchased some Wolf Brand Chili coupons that were going to expire on the 31st of Dec. The coupons arrived on Monday the 28th and I used them on Tuesday the 29th; thankfully my double coupon store had the chili on sale that week and I was able to get several cans for 50-cents each. We love to snack on nuts and normally buy the "off brand" when they go on sale; but thanks to some 1-dollar coupons I was able to get Planters for 2-dollars a can. Buying coupons through e-bay is working out pretty well but there is a drawback; I feel obligated to use "all the coupons" so I do not waist them! I guess I better begin sharing coupons with my friends. Elizabeth is always wanting to play a game but Candy Land and Chutes and Ladders do not excite me; my favorite game is Scrabble. I have recently begun teaching Elizabeth how to play. (I taught Jonathan how to play when he was young and now he wins almost every time!) This evening we played and Elizabeth was so proud because she came up with the word GOAT without my help.